It's no surprise to see a Sun City community on the list. The Sacramento area has a lot to offer for active adults. It enjoys great weather year round, has a thriving downtown, and offers easy access to some of the best outdoor recreation in the state. While the cost of living is higher than other cities in the country, Sacramento is home to several reasonably priced age-restricted communities. Below we’re exploring the top five lowest-priced communities found in the Sacramento region. Suncountry remains a top choice for homebuyers seeking a safe, peaceful community in the Sacramento area. This gated 55+ community has just 307 single-family homes which create a strong sense of community. The homes are affordably priced, beginning in the low $200s, and offer between 980 and 1,500 square feet of living space. Residents of Suncountry keep busy with two on-site clubhouses. In the main clubhouse, residents can spend some quiet time in the library, enjoy a game of billiards, play a game of table tennis, or meet up in the multi-purpose room. Outdoor amenities include a tennis court, horseshoe pits, picnic area, and trails for walking and biking. There is also space available for RV parking. The second clubhouse provides an outdoor pool and an additional tennis court. With just 177 homes, Destinations at Vineyard Point is another great option for those interested in a small, affordable 55+ community in Sacramento. Development of this gated community was completed in 2015, which is definitely a highlight for homeowners seeking modern floor plans and newer constructions. Some of the homes are even outfitted with solar electric systems. The 2,500 square-foot clubhouse serves as the social and activity center of Destinations at Vineyard Point. Here, residents can maintain a healthy lifestyle with the exercise room, as well as the aerobics and dance studio. There is also a gathering room, dance floor, and an entertainment area. The outdoor pool and spa and spacious sun deck allow residents to enjoy California’s sunny weather all year. Heritage Park maintains a strong sense of community while offering a vibrant, amenity-rich lifestyle. It is also ideally located near Sacramento International Airport, as well as other conveniences. This 55+ community has 965 homes in a gated environment. These residences include single-family and attached homes coming in two dozen floor plans. The community’s 25,000 square-foot clubhouse offers many ways to stay social and active. This clubhouse brings residents together with a fitness center, pub, hobby and game room, arts and crafts studio, library, and more. Outdoors, the amenities continue with a pool and spa, two lighted tennis courts, pickleball courts, horseshoe pits, and a volleyball court. There are also gardening plots available, as well as walking trails that wind through the community. 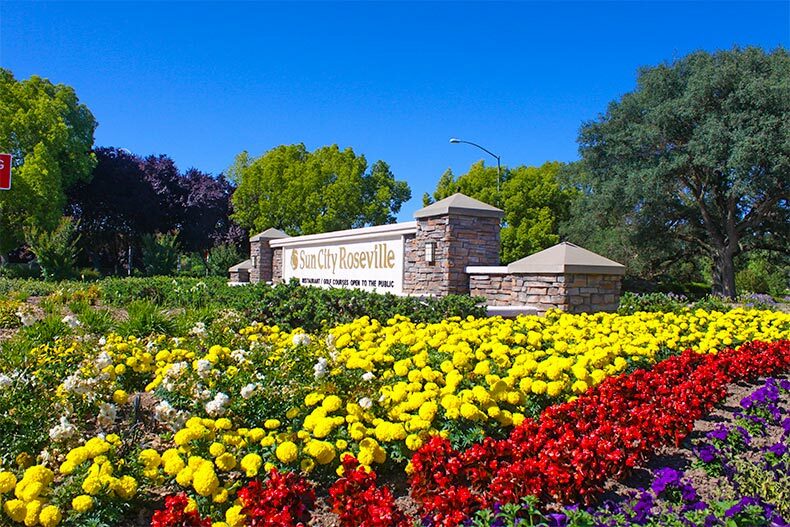 Sun City Roseville allows residents to live an amenity-rich lifestyle while being tucked away between the Sierra Nevada foothills and the Sacramento Valley. This 55+ community consists of 3,110 single-family homes ranging from 878 to well over 2,000 square feet. Residents can expect to enjoy the vibrant lifestyle that has Sun City communities so popular. The on-site Timber Creek Recreation Lodge is a 52,000 square-foot center that offers an impressive lineup of amenities. It has a top-notch fitness center, indoor lap pool, hobby and craft rooms, grand ballroom with a stage, and more. Outdoors, residents can swim in the resort-style pool or play a game of golf at the 18-hole Timber Creek Golf Course. Heritage Vineyard Creek is a great choice for active adults searching for a brand new 55+ community. Development broke ground in 2017 and is ongoing, so home buyers can enjoy the many perks of being part of a new community. Upon completion, Heritage Vineyard Creek will have 171 single-family homes ranging from 1,743 to 2,206 square feet. As part of Lennar’s “Everything’s Included” program, homeowners can select from popular upgrades – such as advanced solar systems, quartz countertops, and stainless steel appliances – at no extra cost. Residents are served by an exclusive clubhouse called The Resort. This modern clubhouse offers a fitness center, gathering area and activity room, a cozy fireplace, and a kitchenette. Outdoor amenities include a swimming pool and spa, lighted pickleball courts, community garden, and vineyard area.